It was hot in Melbourne yesterday. Thirty seven degrees (99°F). Not off the charts hot but hot enough to make you sweat doing nothing at all. And if you weren’t doing nothing at all? If you were pushing hard in the heat with demands being made of you, emotionally and psychologically? If you were pushing hard for a few hours and then had to lift it again long after the well had run dry? Then the heat might pose a more critical problem than mere discomfort. Then the heat might cause you to vomit. It might cause you to almost pass out. It might lay you very low indeed. That’s what happened to one of our karate students yesterday in the middle of his grading. An enthusiastic and talented adult beginner whose love of training is palpable, he had to excuse himself and run from the dojo floor clutching his mouth. That crisis over, he resumed his grading only to succumb moments later to probable heat exhaustion and possible dehydration. He was laid down with an ice-pack and given a short but sufficient time to recover. And then he went home. End of story. No, he didn’t go home. He stood up and walked to the middle of the dojo floor and finished his grading with renewed strength and conviction. He achieved a very successful pass in what ended up being difficult circumstances. He had to overcome physical and mental disorientation and not give in to feelings of failure, all in front of his peers and his instructors. He made a choice to step up and back himself. And he delivered. But how easy would it have been to put his hand up and say “sorry, I can’t continue today”? It would have been a very reasonable thing to do, no shame or disapproval incurred. But perhaps the student would have walked away feeling rather flat. He may even have thought “I’m not really cut out for this karate stuff” or he may just have set a precedent for collapsing under pressure and found himself haunted by the memory of the mini-crisis every time he had to face something difficult. A cycle may have been set in motion. A ‘glitchy’ pattern of behaviour embarked upon. All because of a different choice. I remember being good-naturedly ridiculed on the subject of choices when I was in my mid-twenties and had just come out of a very serious relationship that had left me all at sea. Reflecting on my break-up I was holding forth on the consequences of choices and how for all the perceived ‘wrong’ choices that may have gone before one was only ever a moment away from making a new choice that would dictate a ‘right’ future. I suppose I must have been overly emphatic in my deconstruction of all the implications because my friends just rolled their eyes as if to say “just get on with it”. Get on with it I did and the very conscious choices I made at that time ultimately led to me meeting my wife and we all lived happily ever after… Well, not exactly, but not a million miles from the truth. 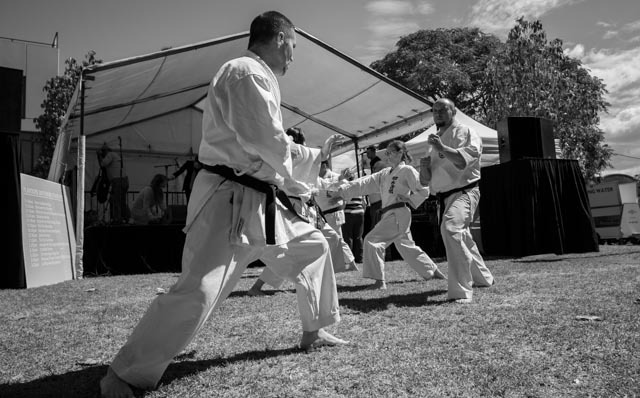 Just like the karate student yesterday, mini-crises present themselves all the time and depending on how well you deal with them they can be very destabilising forces in your life. The way you juggle the relevant factors of the crisis will determine the hold it exerts on you. This behaviour compounds the negative. It locks it in just a little bit more insidiously and grants it further control over your life. Think about that for a second. How often do you add one bad decision to another? A more useful question might be to ask how quickly you recognise a bad decision. Because of course if you don’t recognise a bad decision how can you choose not to make it? Central to this ‘blind spot’ in all of us is a complacency of awareness. We do things on automatic pilot. Why? Because it’s so easy just to trundle along in that unquestioning way that is so seductive. We choose not to rock our own boats. Sure why would ya! Nobody is going to willingly capsize themselves. Or are they? Our decision-making is connected to our patterns. Our patterns are connected to our beliefs. Our beliefs are connected to everything that we have been exposed to in our lives up to that point. A pattern is a set of decisions we make on a recurring basis that we consciously (or otherwise) believe will achieve a particular result. Namely, survival. And yes, survival is a very relative term depending on your particular set of circumstances. If you are a refugee or an asylum seeker, a victim of domestic violence or a cancer sufferer for example, then survival becomes a literal term. But for the rest of us survival is more synonymous with general concepts of happiness, success and stability. In turn, those concepts are going to be subject to what we believe about ourselves and what we deserve from life. My own belief is that I only deserve from life what I put into it. Therefore if I make bad decisions on a continuous basis I don’t especially deserve to escape the consequences of those decisions. On the other hand, if I make good decisions that create a positive situation in my life then I should enjoy that success. Now I don’t really like putting decision-making in those terms – ‘good’ or ‘bad’ – it’s not very Zen, is it? There’s no good or bad, there are just decisions. Fine, I accept that. But it is a bit naive not to acknowledge the result of those choices. There’s a certain credo that has become very popular in modern team sports and is particularly popular in rugby union. I think it is appropriate to use it here. The flashiest team always wins. No, that’s not it. The team with the best players always wins. Nope. The team with the greatest technique always wins. Nah. It’s rather more prosaic than any of those. The team that makes the fewest mistakes always wins. In a game as attritional as rugby union where the line between winning and losing is sometimes excruciatingly fine, this wisdom is very often borne out by successful teams. And rugby is a game that is hugely dependent on patterns and effective decision-making. One wrong decision could result in a 14-point swing. from +7 all the way down the number line to -7. Ugh. If that is a crisis on the playing field do you think the responsible player will make the same decision next time? Highly unlikely. The player’s survival is at stake. If they want to stay on the team they have to demonstrate the ability to recover. They have to demonstrate they are still able to contribute to winning patterns. When they prove they can do the right thing that is behaviour they will seek to reinforce until the next challenge comes along. Back to our crises and mini-crises. Maybe we should look at how we choose to react. Maybe we can choose a different path, one that leads us to a calmer place. One that helps us get perspective on our problems. And on our patterns. That might lead us to reassess what we believe to be true. And in the process we might discover something about ourselves that we didn’t know before. That we can survive better. Don’t compound the negatives. Reinforce the positives. Back yourself. Thanks K, glad we’re in synch! I’m not familiar with that book but I’ll happily look into it, thanks for the recommendation. Very good old boy, quite poignant for me at this time, keep up the good work. Thanks Shane, glad it struck a chord. Hope life is treating you well and your ears are in good shape!